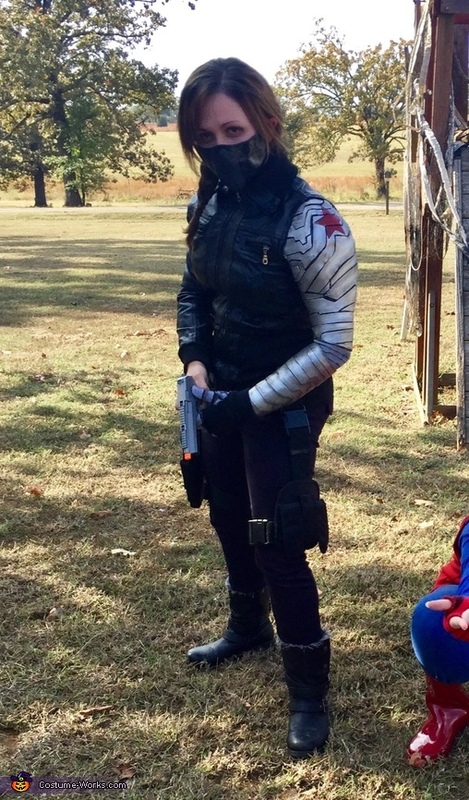 I went for Halloween as Marvel's Winter Soldier. I saw a lot of tutorial on how to make a metal arm on pinterest, and thought it was an awesome idea, but I decided to put my own twist on them for my own costume. The arm was made by wrapping my own arm in plastic wrap, covering that wrap in masking tape, then cutting it all off, taping the shapes back together, and cutting it into the right shapes for the upper-arm and fore-arm pieces. I then cut the pieces arm design out of craft foam, stuck them on one-by-one, spray painted it all silver, and added details with acrylic paint. I hand painted a white sleeve and glove so I would be able to move my fingers and elbows. I made the mask out of paper mache. The only other thing I had to get crafty with for this costume was the jacket. I got it from a thrift shop then cut off the left sleeve for the metal arm. The rest was just finding a tactical belt, appropriate colors for other clothing, and some dark makeup over my eyes.